What explains California? To a large extent, as Philip Fradkin's rich, exuberant portrait makes clear, it's the multiple landscapes and the different states of mind that best define America's most populous, diverse, and fabled state. Fradkin divides California into seven distinct ecological and cultural provinces—from the hot deserts and high peaks to the rich agricultural Central Valley, the redwood forests of the north and sandy beaches of the south. Describing geographical regions based on their emblematic landscape features, Fradkin intertwines natural and social history. 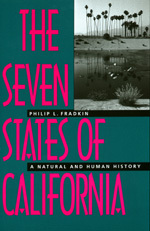 Philip Fradkin is the author of six highly acclaimed books on the American West, including the newly updated A River No More (California, 1996). A former environmental writer for the Los Angeles Times, he also served as Assistant Secretary of the California Resources Agency, as Western editor for Audubon magazine, and has taught nonfiction writing at Stanford and UC Berkeley. He shared in a Pulitzer prize awarded to the Los Angeles Times for coverage of the 1965 Watts racial conflict.